In my dreams. 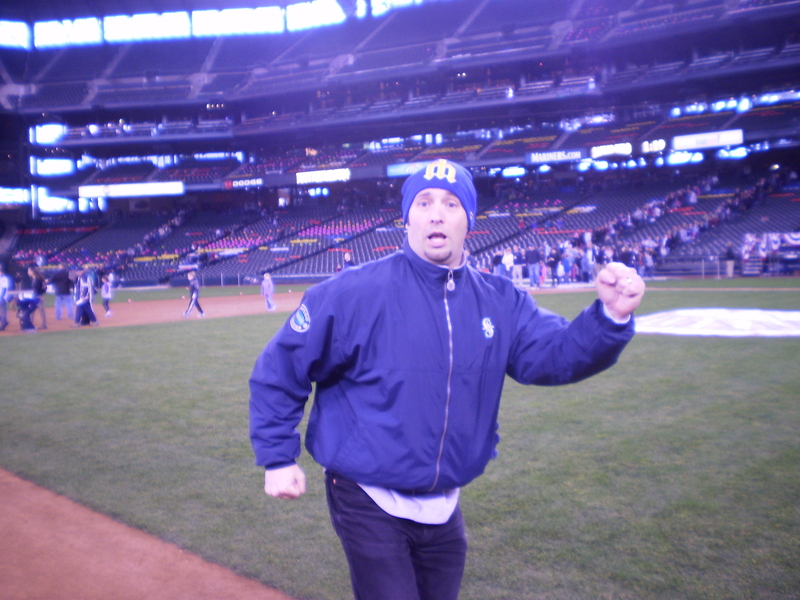 I’d be better suited for cleaning up Safeco Field than hitting cleanup! However, I will be at the ball park this afternoon emceeing the Greater Seattle Chamber of Commerce After Hours. If you are in the greater Seattle-area, drop by Safeco Field at 5:30 for a fun evening of networking, prizes, and baseball. We only really did two things on Saturday, however they were both tremendous. 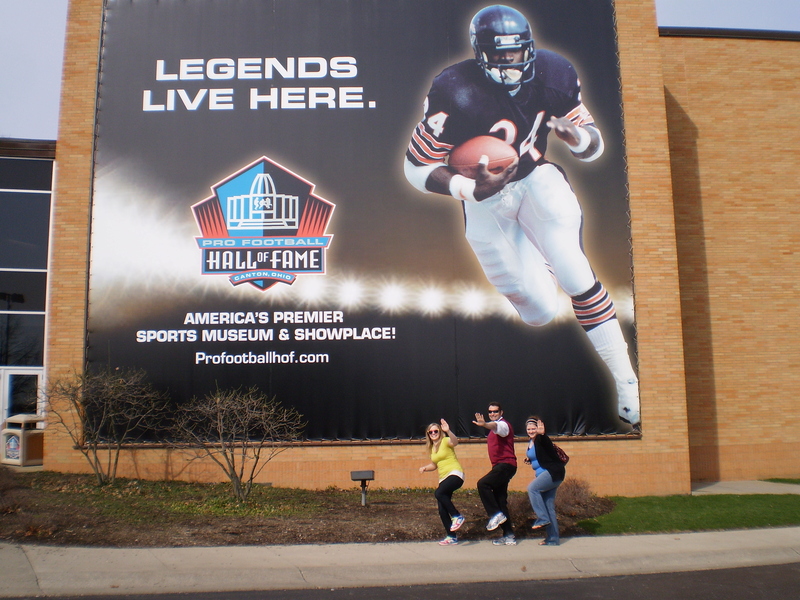 We started the day by driving 90 minutes up Ohio to Canton to visit the Pro Football Hall of Fame. We spent 5 hours engrossed in this wonderful museum. Even Barb, who enjoys football the least among the four of us, was surprised at how much she enjoyed it. 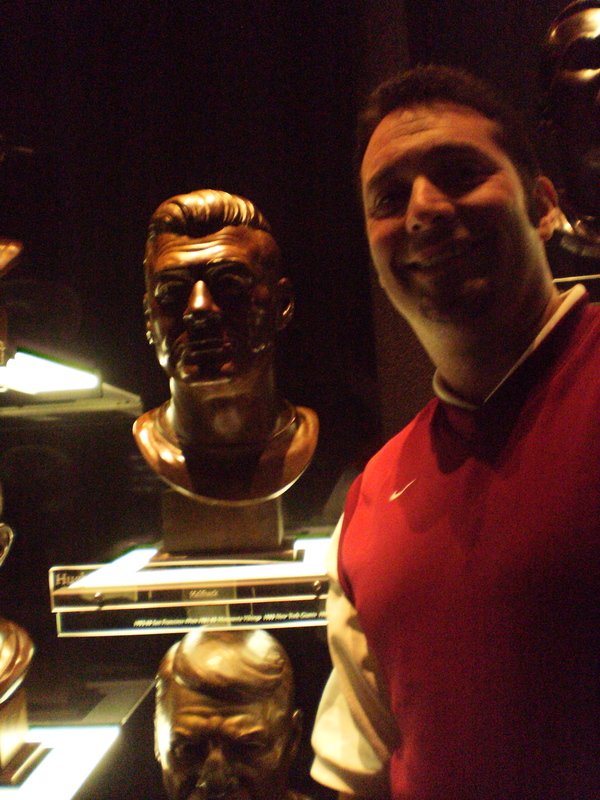 The room where the nearly 260 busts are held is awesome. I can’t really describe the depth of what you feel as you walk through the room admiring the men who made the game of football this country’s modern-day pastime. 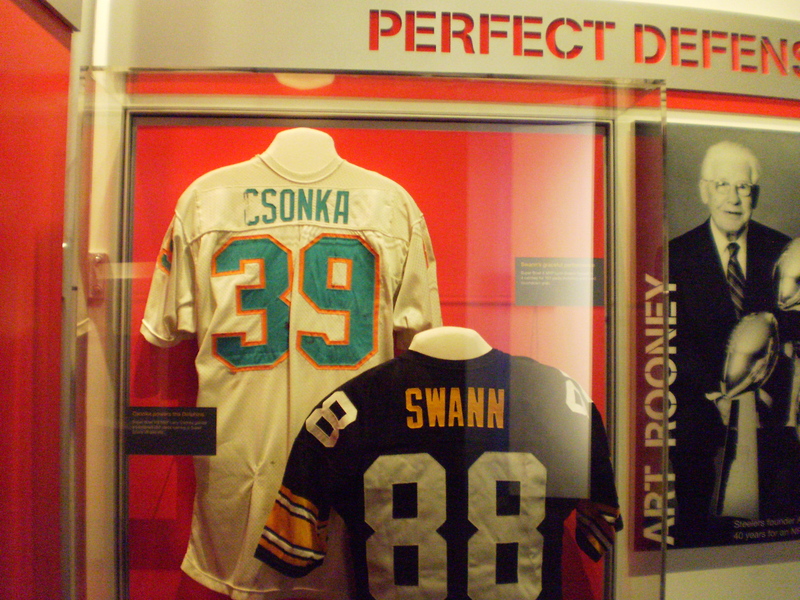 The museum was filled with unusual artifacts, exhibits honoring every team, a Super Bowl room, interactive games (Kelli won our play calling game – I came in last), and a room with memorabilia from today. In fact, the shoes Chris Johnson wore against the Seahawks when he broke the 2,000 yard rushing barrier last year were displayed. The cool thing for us was that we were there. After the HOF, we spent the evening in Pittsburgh with Barb’s cousin and her husband. Barb had never met her in person, so this was a great evening. It turns out they have a lot in common and we all became quick friends. They live in a beautiful house built in the mid-1800’s, which, just like our morning excursion, gave us a taste of history. We had a terrific day in Steubenville yesterday. I had the great fortune of accompanying my daughter Mindy to one of her classes. I was the only non-student in the embryology class, I heard all the words, but certainly couldn’t put them all together. I now know that the money we spend on tuition is well worth it! We also had the chance to have dinner with Barb’s uncle who was down from Buffalo on his way to Baltimore. Barb’s cousin lives in Pittsburgh and it was very fortuitous that he was passing through. We had a wonderful dinner and a a splendid time catching up with family. My Huskies did go down in flames to West Virginia in the Sweet 16 college basketball game. I did however toast them for a great ride. Tonight is Mindy’s ceremony at school. After 15 years of schooling, it’s extremely satisfying to be part of this grand event. The first sale is to yourself. Confidence is the most important tool for any business professional. Ironically, it’s one that is most often lacking. This past weekend, I was a judge for the Miss Moses Lake Scholarship pageant. They crowned three winners who will each go to the Miss Washington event. I was impressed with all the young ladies because it takes a great deal of confidence to speak and perform in front of judges and a large audience. That being said, you could tell the different levels of confidence for each. Those that had competed before showed more confidence than those who hadn’t. That confidence comes out in all you do and usually means you come out on top. The more these young ladies compete and practice, the more confident they will become and it will carry over into all phases of their lives. The same can be said for business. You have to have confidence to toot your own horn; to take risks; to be contrarian; to be in the spotlight. If you don’t have great self-confidence, you just won’t be as successful as you could be. Business is tough and can be “dog-eat-dog.” It’s easy to become discouraged. But if you’ve made that first sale to yourself, then you will have the true belief in your services and products to help others. But that first sale must be made, and it’s often to most difficult. How strong is your confidence? What must you do to make it stronger? Watching the NCAA tournament reminds me of the power of momentum. As a former high school basketball coach, I remember pounding the idea of “Big Mo” into my players on a regular basis. Momentum, both positive and negative, is contagious. It often decides the outcome of a basketball game. It also often determines the outcome of your business. Where is your momentum? If it’s on a negative slide, you must do whatever it takes to change it. Make alterations to your schedule, try new techniques, visit clients, ask for more referrals, etc. Take calculated risks and get the momentum turned. If you are on a good cycle, put your foot on the accelerator. Keep momentum going as long as you can because it will literally “will” you to success. “Big Mo” is decisive in basketball and in your business. Get it on your side. I’m constantly trying to improve my language and vocabulary. Whenever I run across a new word, I try to quickly learn it and use it in conversation. I also want to share it with you. 1 – Volition in its weakest form. 2 – A mere wish; unaccompanied by an effort to obtain it. Example – The debate in the House of Lords would convert the impartial listener from any velleity towards single-chamber government. Posted on March 11, 2010 March 11, 2010 CategoriesProfessional DevelopmentTagsBusiness, coaching, Mentoring, Professional DevelopmentLeave a comment on On Thin Ice? I just returned from three days in New York, where I finished the accreditation process with Alan Weiss for his Master Mentor program. It was my first trip to the Big Apple so I made sure to spend time seeing the sights. I really enjoyed just watching the ice skaters at Rockefeller Center. There are constantly a large group of skaters ranging from the very good to the teetering on the brink. At one point, I two completely diametric levels of expertise. One young man looked like he could have been in the Olympics. He flawlessly jumped, skated, and twirled all over the rink to the amazement of all. Not far off, a gentleman had a death grip on the side railings with a lady clutching his elbow to help him support. He wore a large grin as a he worked at trying to stay balanced on his skates. This reminds me of each one of us in our business careers. There are times when we are the Olympic skater and there are times when we are on the brink of falling on our duffs (and often do); and everything in between. The critical issue is to be like the man learning to skate. Accepting help, being humble, being willing to keep trying, and keeping focused on improving. Just because someone is more advanced than you now doesn’t mean you are a failure. It means you have something to strive for. In fact, seeking out mentors is part of that process. Finding that Olympic skater and learning from them is worth it’s weight in gold. Time to get off the rail and be willing to take a few spills in the name of progress. I only got one book finished in February…still working on a couple now. The book I read is the classic Charles Dickens novel, A Tale of Two Cities. Always a great read!